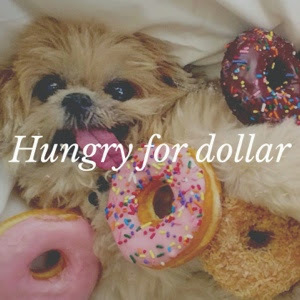 If you read my blog even occasionally, you'll know I'm broke. You'll also know, if you've followed my blog for a while, that when I did have money, one of my greatest joys was going out for meals with friends to catch up. I'm a social media/internet nut. Plus, I follow lots of London eateries. This means over the last year I've created a list of places I must must MUST visit when I'm earning a regular salary again (trust me, I could have easily doubled this list). So here is my rundown of my top 12 places to eat in London. Disclaimer: do not read if you're feeling hungry! I love pancakes in all shapes and forms, my favourite so far being from The Breakfast Club. However, Shutterbug does amazingly inventive flavour combos such as pretzel & peanut butter and millionaire shortbread (pictured). 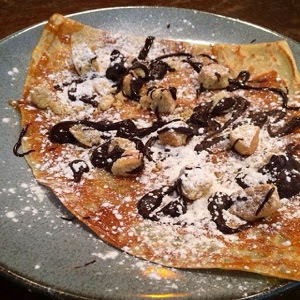 They also do savoury pancakes if you haven't got a sweet tooth, like me. And if pancakes aren't your thing (who are you? ), they do scrummy breakfasts. Afterwards, wash it all down with a cocktail or two. What a cute idea! 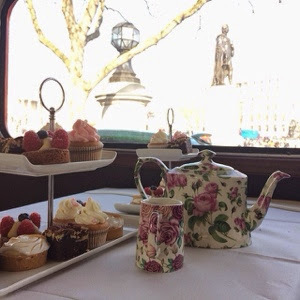 You get the classic afternoon tea lark - scones, cakes, finger sandwiches and tea - all while being witness to a wonderfully British tour of the capital. In a red London bus, of course. It's not the cheapest, but I'd love to do it as a one-off. It's ideal if you're having a friend down and you're the type of people who prefer to enjoy the sights inside in the warmth, with plenty of clotted cream. 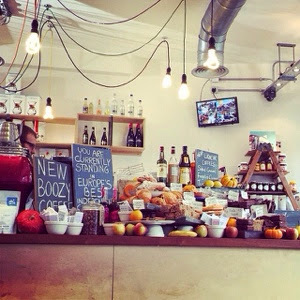 I remember coming across this café and really falling in love with the interior. Yes, the whole 'shabby chic' look is very done around these parts, but they've made it look really homely and decked it out with some super cool lampshades. I can picture myself as a too-cool-for-school freelancer, whiling away my days here with a boozy coffee and hefty slice of cake, complete with a MacBook Air (I can dream, okay?). For those on a health kick, they do juices and healthy teas. The locations mean it's super good for people-watching, too. Slowly but surely, Dishoom seems to be taking over the capital, recently opening their newest branch in Kings Cross. I'm really quite desperate to try out their breakfasts, which are a British-Indian fusion. It was a favourite of a former colleague of mine for press appointments. My pick would be "The Big Bombay" which the website says comprises of "Abundant Akuri, char-striped smoked streaky bacon from The Ginger Pig, peppery Shropshire pork sausages, masala baked beans, grilled field mushroom, grilled tomato and buttered pau buns." Goodness me, that sounds good! How beautiful in this room? Wow. 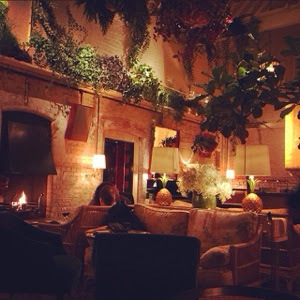 Settled inside the luxurious London Edition hotel, this restaurant certainly makes a statement. According to my top-notch social media stalking, it's usually full of business people taking clients out with the intention to impress... Which I imagine it does! 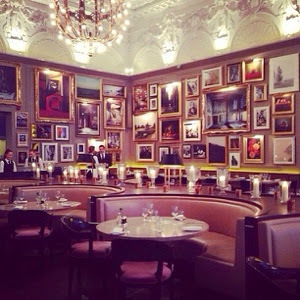 Berners Tavern - making every occasion special. That should be its tagline. Food-wise, dinner is an á-la-carte affair and the very best of British (I.e. posh pub food). Would you look at that burger? Now THAT is a burger. Admittedly, I'm not the biggest burger fan, but London is so devoted to burgers that there's no escaping them. 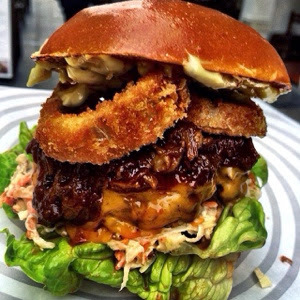 I did love MEATliquor, but I've had my eye on Patty & Bun ever since it opened its first branch on James Street a year or so ago. I'm not too adventurous with burgers, but after a perusal of the salivating menu, my pick would be the ARI GOLD Cheeseburger with bacon. Drool. A moment of silence for this slab of perfection, please. When I first moved to London, Hawksmoor seemed to be London's little secret. 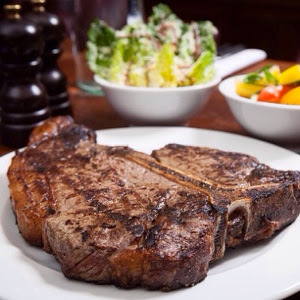 But word-of-mouth has spread the wonder of Hawksmoor's juicy steaks and now it's become the place to go for some mighty meat. You can also get burgers here, but why bother when you can get burgers EVERYWHERE (see above). Don't be that person that goes to Pizza Express and gets a salad, for goodness sake. If you haven't heard of this place, where have you been? 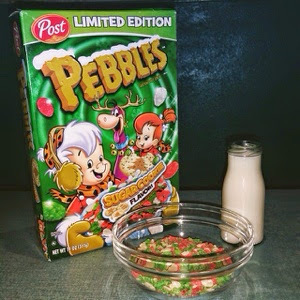 It's been all over the news recently with people complaining about paying the same amount for a bowl of cereal as you would a whole box. But HELLO, what do you think it costs to make a cup of coffee? And yet you're perfectly happy forking out £3.50 at Starbucks. So for the novelty of visiting a cafe that specialises in cereals from around the world (over 100, wowza) plus the bonus of being surrounded by guys with beards and geek glasses... It's worth it. So shush. This place has had RAVE REVIEWS. Seriously - I have yet to hear anything bad about it. According to people who have been, Bob Bob Ricard is snazzy without being pretentious, and the perfect setting for a restorative glass of champers to break up a hard day's shopping. 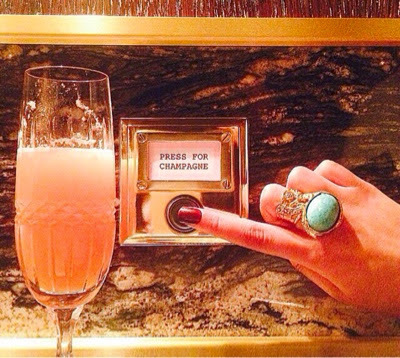 The signature snap is the "press for champagne" button at every table (genius). It attracts all types with a bit of money to blow, and is definitely a step up from a Costa toastie. I'm all about trying the infamous Lobster Mac 'n' cheese. The interior is also super glam and has a bit of 1920s Gatsby glamour about it. Lobster at a reasonable price? Sign me up! 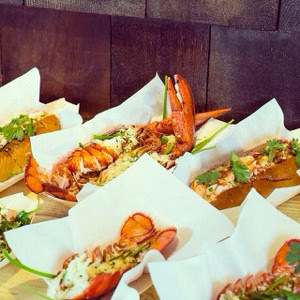 Along with burgers, lobster is fast taking over the capital. I guess it makes sense, as London has been crowned the most expensive city in the WORLD, and lobster is amongst one of the world's most expensive dishes. But the good news is, the lovely people at Lobster Kitchen (and Smack Deli, also on my list) are keen to make lobster accessible to the plebs of the world, too. Huzzah! The Garlicky One sounds incredible. Brunch is my favourite meal, hands down. 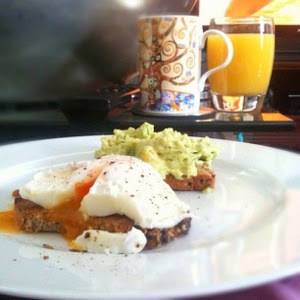 Nothing makes me happier than a bit of poached egg and hollandaise goodness. I don't know how I've managed to not visit The Riding House Café as it's so so central. I don't think I've ever walked past it, either. And so, it remains a tasty enigma... and for that reason, I simply MUST go. 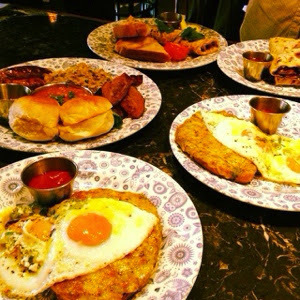 The chorizo hash brown is enough to make my mouth water, and the cocktail menu = winner. Are there any more eateries I need to know about? Tell me! I'm actually going to Dishoom on Sunday - I'm so so excited!